Gumball, gives you the chance to win this beautiful bracelet from J.Crew, just register and you will be participating. For more entries you can follow us on twitter and facebook. 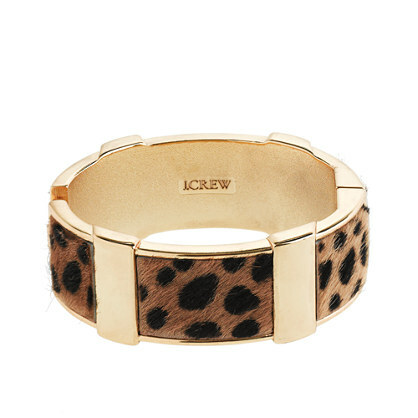 The leopard trend is here to stay and you can wear a piece of it on your wrist with this gorgeous calf hair bracelet by J.Crew. Wear this bangle by itself or layered and show everyone how to take a walk on the wild side. Stunning! !do you want to follow eachother? I wait for you for a "vanity fair Beach party"!! HAVE A NICE DAY!! What a great bracelet! Lovely giveaway! oh my this is such a glamorous cuff! thanks! .. Followedd! thanks for you comment!